Sambal are normally used in Indonesian ,Singapore and Malaysian cooking mainly using red hot chillies which is super hot and spicy. It’s blend with dried chillies or red chillies, tomatoes, onions, garlic and ginger. Lime juice is also added to give a sour taste to the dishes. 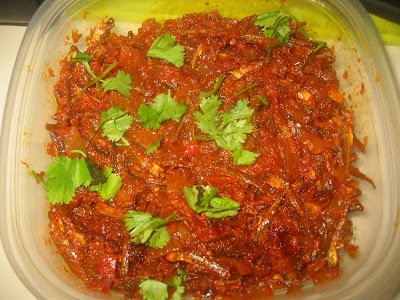 Today I’m going to share my recipe of sambal fish, which goes well with steamed rice or any variety rice. Hope you will enjoy another taste bud of Singapore recipe. Coat a frying pan with 2tbsp oil and roast all the above mention ingredient and grind to a smooth paste once cooled-keep aside. Marinate the fish cube with all the ingredients in large bowl and leave in fridge overnight. Coat a non-stick frying pan with 2 cup oil and shallow fry the marinated fish cubes-drained and keep aside. In another wok add 3tbsp oil and add mustard seeds. Once the seed starts to crack add the chopped onions and tomatoes. Sauté them till they become tender and pour the sambal paste and bring to a boil. Once the paste starts to boil add the fried fish and cover with lid. Let the cook well in the paste for about 10 minutes or until the oil starts to separate. Remove the lid and adjust the level of salt and serve hot with steaming white rice.